From Sweet Muse : "Sweet Muse celebrates the creative, playful s pirit in all of us with handmade treats to indulge the senses and inspire. A choice of twelve tempting flavors, beautifully packaged for gift giving or sped quickly to your door to stimulate your own creative juices. Treat yourself, your friends, or your family. Have fun. Be inspired!" "Sweet Muse gourmet fudge brownies are freshly baked from scratch using only the finest ingredients, including premium dark chocolate, sweet creamery butter, farm fresh eggs, and pure vanilla extract. Never any artificial preservatives." I was sent the Brownie Buddy Gift Box which included a Fudge Brownie and a Turtle Brownie. The Fudge brownie was very moist and delicious but OH MY the Turtle brownie was one of the best brownies I have ever had, it is made with cashews and chewy caramel ! I never had cashews in a brownie, it was great ! Sweet Muse also gives you a little surprise and makes indulging in these treats even more enjoyable, each full-size fudge brownie is wrapped with a message inside.The quotes reference art and creativity, but they might also be inspirational, philosophical, witty, fun, or just plain silly. 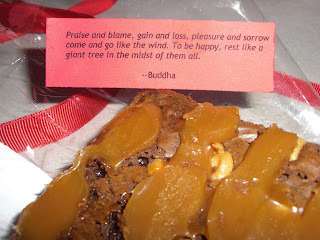 Sweet Muse can customize the quotes for the holidays or events. 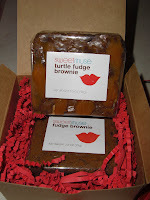 Visit Sweet Muse and tell me what brownie you would like to try. One winner will be chosen ! I will be using a random number generator to select the winner. Contest ends at 11:59pm CST on Tuesday March 17,2009.If the prize is not claimed in 48 hours a new winner will be chosen.Contest open to U.S. residents only.The winner will be announced on my blog(and emailed) Wednesday March 18,2009. I would like to try the turtle brownie :) Yummy!!! I would try the pecans and toffee variety. I would love to try the plain fudge brownies. I would love to try the Hazelnut Swirl. The walnut brownie sounds delicious. Actually, they all sound delicious. Thanks so much. The Turtle Brownie and the Peanut Butter Chip both sound delicious. Peanut Butter Chocolate Chip. Yum! I would most like to try Deep Dark Double Fudge! I am definitely a choc-o-holic! I would love to the the fudge. I am a huge fudge fan and this would be perfect! I would like to try the toffee bar crunch! I'd love to try the pecans and toffee. That sounds so good. I wish they had those types of flavors at the grocery store. Turtle Brownies sound great ! They all look so yummy! I'd like to try the peppermint crunch. Thanks for sharing! My first choice would be Peppermint Candy Crunch. I'd like to try the Peanut Butter Chip brownie. Oooooh, the Peanut Butter Chip looks great. I would really love to try the fudge brownie. I just love brownies! Thank you! The Toffee Bar Crunch looks so tempting and my mouth is watering just thinking about them. Ohhhh I am having brownie cravings now! They all look delicious, but my eye is on the Peanut Butter Chip Brownies! The turtle brownies look decadent. My "OpenID" is my contact email. I would love to try the fudge brownie! They look mouth-watering good. The peanut butter mini chocolate chip sounds amazing! Thank you for offering this giveaway! eyeslikesugar [at] gmail [dot] com. I am a fan on Facebook. (Becky) Thank you for offering this giveaway! eyeslikesugar [at] gmail [dot] com. I'd die for the Turtle Brownie! toffee bar crunch -- yummy! Deep Dark Double Fudge, YUMMY!!!! I would love to try the Turtle brownie. I'd love to try Sweet Muse's "Toffee Bar Crunch" brownie. Yum! I'd love to try the Fudge, yummy! Oh my goodness - I have to try the Peppermint Candy Crunch. It looks delicious! Turtle or toffee for me please! Pecans and Toffee for me, though it's a tough choice! Thanks for the giveaway. The peanut butter mini chocolate chip looks delicious. Deep Dark Double Fudge is something my Hubby would go CRAZY for! Life in a House of Blue is on my Blogroll! I'm a fan of Life in a House of Blue on Facebook! Oh my gosh, brownies are my downfall! The walnut brownies look wonderful. The Peanut Butter Chip brownie looks A-MA-ZING!! I would like to try the toffee bar crunch. It sounds yummy. I would so love to win!! Thanks for the Chance. The deep dark chocolate fudge ones sound yummy. I would love to try the pecans and toffee! Yum! I like the Deep Dark Double Fudge Brownie! I'd like to try them all! Especially the toffee bar crunch! The pecans and toffee brownies would be my first pick!! Following on twitter and tweeted!! Deep Dark Double Fudge sounds heavenly! the turtle brownie sounds so good. I would choose the delicious looking Toffee Bar Crunch brownies. the toffee bar crunch looks amazing! well, they ALL look amazing! thank you for the great giveaway! I have blogged about you at http://vanburenmom.wordpress.com the blog entry is titled The Mom Daily 3-10-09 and will be up with in the hour as soon as I finish typing it and spell checking it. Peanut Butter Mini Chocolate Chip brownie sounds very tasty. Coconut almond sounds heavenly! Yummy. I would love to try the Turtle Brownie, but all of them sound so yummy! Thanks so much for such a wonderful giveaway! I am also subscribed via email. I would love to try turtle! Tough choice but today the Hazelnut Swirl Brownie sounds delicious. I'm torn between Peanut Butter Chip and Deep Dark Double Fudge. Please accept my entry. Thank you. I would like to try the pecans and toffee. I would love to try out the Deep Dark Double Fudge -- sounds wonderful! The toffee bar crunch sounds too good to be true. Definitely the Walnut Brownie for me. Would love to try the pecan and toffee brownie! Yummy! Peanut butter chip for me. Yum. I would like to try turtle. Let's start with peanut butter chip. I am all about the Deep Dark Double Fudge! I want the Peanut Butter chip. Wow, the Peanut Butter with Toffee Bar Blondies look spectacular. I would love to try all of them! The first one on my list would be the Hazelnut Swirl. The Turtle Brownie looks yummy.